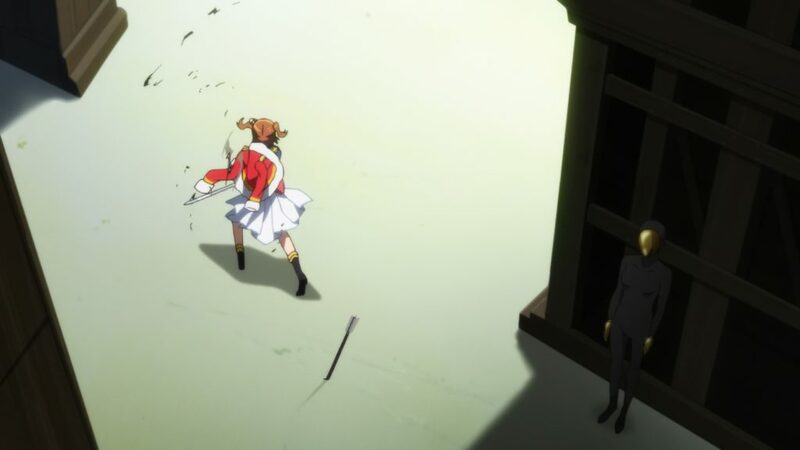 Out of all of this summer’s seasonal anime, Shoujo Kageki Revue Starlight is one of the shows that has grabbed my attention the most. 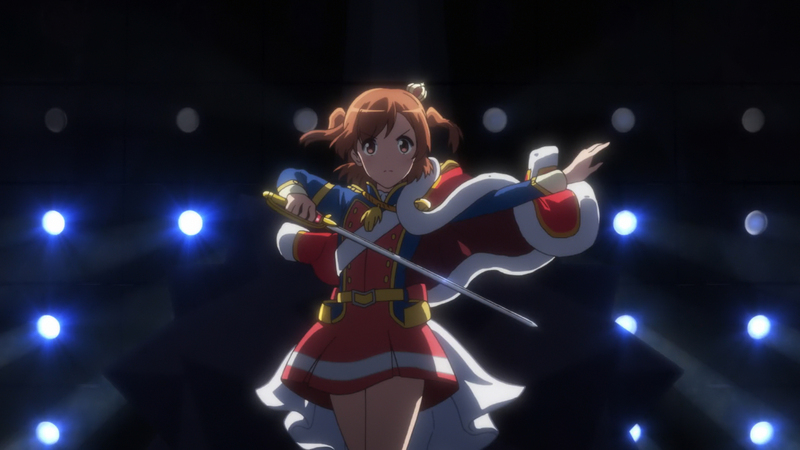 At first glance it seems similar to an idol show, but with acting the main focus rather than singing and dancing (although those do come into it of course), but underneath that it’s a much darker show, incorporating elements of the dark magical girl genre as it pits its main characters against each other in magical girl style combat as they each vie to be the number one star. It’s these sections that are the highlights of each episode so far as they reveal the particular struggles each girl has. Each seems to have a reason for participating in these underground battles and it really shows in the desperation and ferocity of the combat. This is mainly hand to hand fighting with swords and other melee weapons, but a couple of girls use ranged weapons as well. It uses the fact that these duels are theatre performances to make them more fantastical, as parts are acted out in between sword flurries – the scenery changes as the story moves forward, like in one particular duel where stone ruins can be used for Junna to hide behind as she attempts to snipe protagonist Karen with her arrows. And while these duels are cool to watch, there feels like there is more going on behind the scenes – there’s the occasional mention that there is a price to be paid for entering the revue, something that you had to lose. Karen’s childhood friend Hikari continually tries to stop her from taking the auditions, but it feels more like she wants to protect her rather than toss down one of her competitors. And it’s this hint of underlying darkness, that something bad is going to happen, that is keeping me watching. Not to mention the giraffe that is orchestrating is a right weird one and probably has something up its sleeve. Reading around on the series, it’s actually based on the Takarazuka Revue, an all-female theatre group that’s been going for just over 100 years. Backed by the Hankyu Railway company, it’s one of Japan’s most popular theatre groups and for those in the know this might be a good hook to bring in more viewers to the series. While I’m not one for musical theatre, I’d imagine those who are would get more out of it. While I am feeling the anticipation with the story, I am however cautious in hoping for too much as outside of the underground revue it’s a fairly typical show of the idol genre. While it’s not as buddy-buddy as other shows and there are clearly rivals and antagonists in the show’s cast, the happy-go-lucky protagonist, the childhood friend and several other characters all feel like your standard anime archetypes. I get the feeling it’s borrowing heavily from shows like Puella Magi Madoka Magica as the characters feel very similar. Hikari for example is essentially Madoka’s Homura, having a cold and studious exterior, but when it comes to Karen there’s nothing she wouldn’t do to keep her out of harm’s way. 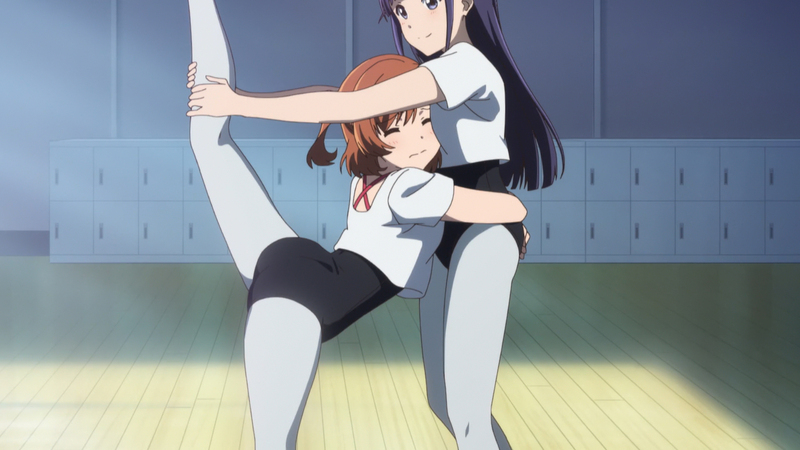 The setting is decent enough at least and although we don’t see too much of lessons in these first three episodes, you do get to see the girls training in various arts, with the dance classroom being one of the main focal points. With the two main idol shows I watch now avoiding this altogether it’s nice to see a serious attempt at showing the school as a proper arts school. So far then I can say I am enjoying Revue Starlight. I do like Kinema Citrus’ work as a whole (with Yuyushiki and Is the Order a Rabbit? being two particular favourites of mine) and after putting out the widely acclaimed Made in Abyss they may be onto another winner here. The question is whether a lot of the mystery about the underground revue will pay off. I’m not expecting anything on the level of Urobuchi, but I hope there’ll be a few twists and darker moments in the episodes ahead. I’ll be watching to the end either way, and I’d recommend giving this a go if you fancy a darker take on the idol genre.